Unser Kundenevent „Nacht der Kavaliere“ am 20.09.2018 im Raum für Herzlichkeit war ein berauschendes Sommerfest mit tollem Rahmenprogramm. Anyone planning to host an event in Salzburg has already chosen a very beautiful destination. If you want to add something extra-special for your guests, Kavalierhaus Klessheim will definitely be the perfect place for you. Genießen Sie Ihren Aperitif, die Seminarpause oder Ihren Workshop im Wintergarten und bei Schönwetter auf unserer Sonnenterrasse im Grünen. Herzlichkeit, Professionalität, kulinarischen Höchstgenuss und eine atemberaubende Location. Sie hätten gerne ein Package-Angebot, wir freuen uns auf Ihre Anfrage! Wir realisieren mit Ihnen ihre Eventideen. This opulent Salzburg wedding location captivates with its picturesque setting amid the palace grounds. You can celebrate the most beautiful day of your life with up to 250 guests, while our catering team promise you an added culinary treat. When you present yourself as an event location, you also make a promise. To yourself, but also to your guests. Everything needs to be perfect: from the event spaces to catering, from assistance in advance to complete on-site service for the big day. Together with your guests, enjoy an unforgettable Christmas celebration amid a magical ambience – and allow yourself to be pampered completely as the year draws to its crowning conclusion. Unmistakable Kavalierhaus Klessheim, with its warmth and sincerity, provides the perfect stage for festivities of all kinds. A place of character and flair, where once even kings and nobility would celebrate. 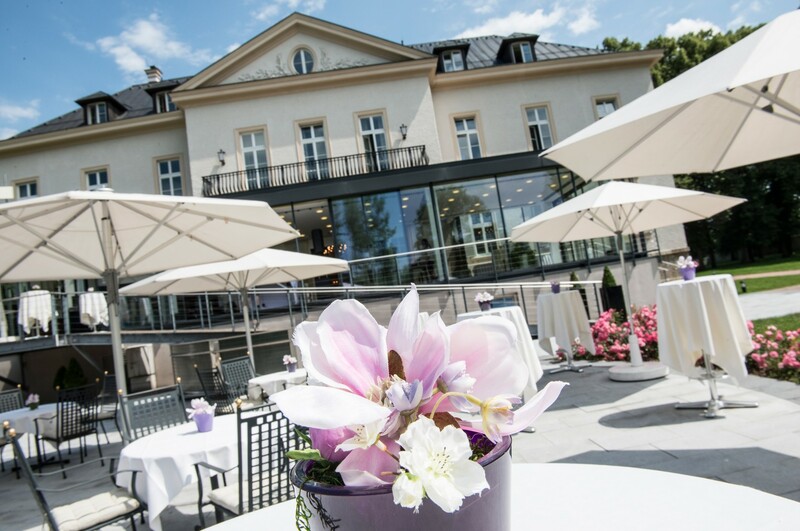 At Kavalierhaus Klessheim, guests have been invited to attend extraordinary events that have left lasting memories. Then as now, this is one of the most popular venues for stylish, exclusive events in all of Salzburg. With its historical halls, fairy-tale grounds and a character uniquely its own, guests are able to immerse themselves completely in experiences that are quite unique. The love for every detail, the expert personal assistance, along with perfect planning, turn every gala evening, ever company celebration and every wedding into "the stuff of legend". And here is another reason why the Kavalierhaus is such a perfect choice: its convenient location straight off the autobahn, with a big car park right outside. The modern, customizable rooms spanning a total of 540 square meters make your event a one-of-a-kind highlight moment. We look forward to welcoming you, too, to Kavalierhaus Klessheim! For an event to become a total success, conscientious planning ahead of the event is an absolute must. From the very beginning, we are right there at your side to help you with every stage of the planning process.